You may be wondering why we are highlighting two books this month. Well, the answer is simple, because they pair well together, and they are important books that all boys and girls should read. This month we want to highlight the books written by Former First Daughter, Chelsea Clinton. 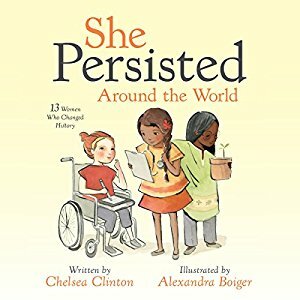 She Persisted, and She Persisted Around the World, are two books about important women that have influenced our world here at home and abroad. Why is it important for boys to read books about women that have changed our world? Because one day those boys will become husbands, they will become fathers, and they will work and learn in this world alongside strong women. It is important for boys and girls to see women succeed, thrive, incite change, and be seen as equal to their male counterparts. When women thrive, men thrive. We live alongside one another, and we work together. So when one person makes the world a better place they do not make it better just for them, they make it better for everyone. The ripple it causes throughout civilization touches everyone. The She Persisted books each highlight important women who have incited change in education, science, civil liberties, healthcare, and literature. The books show the strength and the determination it takes to continue to drive forward in a world that tells you no. This is a message every child needs to learn. Although things may seem tough, and we may struggle, we should never let that stop us from doing something we want to do. We need to keep moving forward. These books make a great gift. Try reading them together with our kids and start a discussion on the importance of trying, learning, and not giving up. 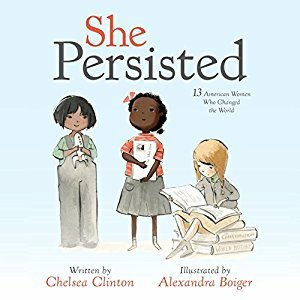 This entry was posted in Learning, reading and tagged Books, boy books, Growing, learning, not giving up, Reading, reading together, she persisted, the boys store on March 1, 2018 by Lacy.